Earlier this year, Attack on Titan gave fans a long-awaited gift when its second season finally debuted. The critically acclaimed anime wrapped its first season back in 2013 before an extended hiatus delayed its comeback more than once. Otakus have been able to enjoy Attack on Titan’s new stories since April, but the series only made it to US television recently thanks to Toonami. And, now, the late-night block is trying to help fans catch up with the series. If you don’t already have plans for the July 4th weekend, then you may want to spend it with Toonami. The program announced today that it would be hosting an Attack on Titan marathon of season two for the holiday weekend. “BBQ, fireworks, and titans! Kick off your Fourth of July weekend with an Attack on Titan marathon. On July 1, we’re showing episodes 26 – 34 from 11pm – 3:30a!” Toonami declared on its Facebook page. The marathon will cover season two up until the anime’s 34th episode. The last episode, which is titled “Opening,” will follow Eren after the hero finds himself kidnapped by some unlikely suspects. If you are not familiar with Attack on Titan, then you should know the popular anime is renowned for its intense action and gritty story lines. 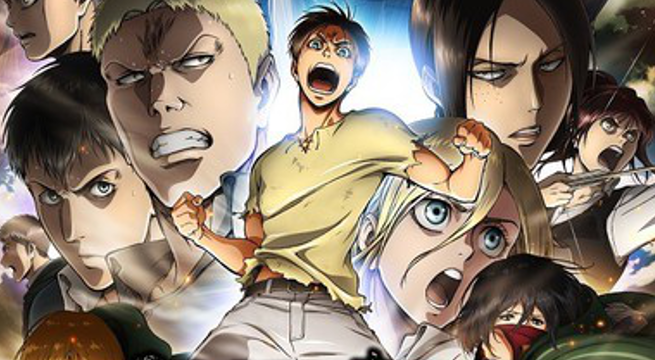 The anime follows a boy named Eren Yeager in an alternate world overrun by massive creatures known as Titans. These mindless beasts have all but wiped out humanity, and mankind is left to cower in fear behind massive walls. When their sanctum is infiltrated by a slew of Titans, Eren and his friends Armin and Mikasa join the military to help eradicate the blood-thirty monsters. But, as they grow older, they learn that the beasts are not what they appear as long-held government conspiracies make themselves known.